Better planning will lead to a smooth and predictable transition. A commitment to achieving the best possible results. We are experienced and certified in mediation and collaborative law. We focus on comprehensive, long lasting solutions that are right for your unique situation. Few divorce law and family law matters have only one cause and one solution. When resolving any family law matter, it is important to consider all the possible options and outcomes. Whether you are looking for the top Boston divorce lawyer or need to consult with one of our knowledgeable family law attorneys, Mavrides Law's divorce lawyers are committed to providing comprehensive solutions and satisfaction for every client. We offer the best Boston divorce lawyers for divorce, mediation, child custody, child support, alimony and post divorce settlements. Lead divorce attorney Marcia Mavrides has over 30 years experience in family law matters. Marcia and her staff of Jennifer Silva, Esq., paralegal Alana Megna, business director Julia Rodgers are consistently voted a top Boston Family Law Firm. Shift your Perspective in 2019: Divorce is about the future, not the past. Alimony in Massachusetts: How Much and for How Long? Marcia Mavrides is a premier Boston divorce lawyer and has 3 decades of experience dealing with Boston family law matters. 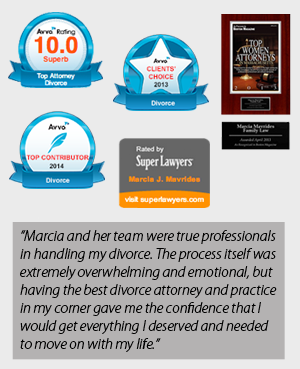 Along with being an experienced divorce attorney, Marcia Mavrides and the other family lawyers of Mavrides Law can assist in matters of divorce, mediation, child custody, child support, post divorce disputes, prenups and postnups. We are proud of our reputation and take great pride in negotiating of behalf of our esteemed clients. Contact our Boston Family Law and Divorce team of Marcia Mavrides, Jennifer Silva, Julia Rodgers, Christina Pashou, Amy Abbott, and Lindsay Allyson for assistance with your divorce or family law matter.